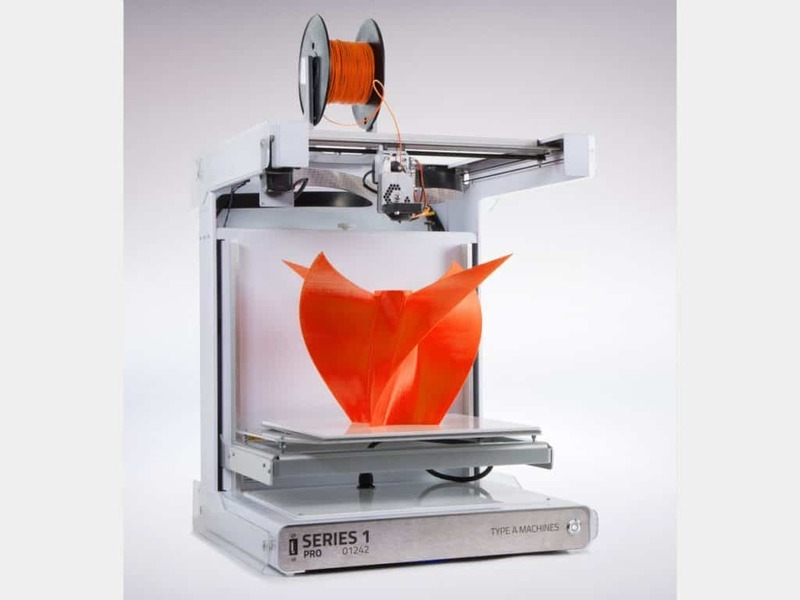 The Type A Machines Series 1 is one of those 3D printers that have benefited from the constant attention of its manufacturer, morphing from a functional, almost kit form level printer, into a sleek modern machine, the latest edition of which was launched in 2016 – the Series 1 Pro. As we dive head-on into testing out the latest Series 1, we’ll be asking whether it is a significant improvement on its predecessors and whether the price tag is warranted. The Series 1 features a polished, nearly surgical design made of a clean aluminum and acrylic body supported by a precision laser cut CNC-milled folded metal chassis. The overall look is striking, to say the least, aided by the dominant white color scheme embellished by a few choice black parts notably the lower front panel adorned with a bold capitalized ”Series 1” logo. The Series 1 is one pretty device that marries both a kind of subdued industrial aesthetic with also Sci-Fi inspired contours and gilding. The arrangement is quite the departure from the original iteration of this model that consisted of a naked wooden body and suffered from a few stability issues. The upgraded Series 1 appears to confine those problems to the past with a robust sideways U semi-open design borrowed from the second generation Series 1 (serial number 2xxx +) that weighs a solid 15 kg/50 lbs. As for how this belle of the ball operates, it uses standard FDM technology with an XYZ cartesian design running on a linear guide NEMA 14 stepper motor for the X and Y axes, and a NEMA 17 stepper motor for the Z-axis, both with 1.8 degrees step angle and digitally interpolated 1/256th micro stepping as well as high-quality bearings. These are powered by a primary BeagleBone Black (1GHz CPU, 512MB DDR3 RAM, 16GB SD drive) and a secondary RepRap Universal board with Allegro and Marlin-based firmware. Pretty standard stuff, but reliable nonetheless. The build area is massive, running up to 305mm x 305mm x 305mm with a hypothetical build volume of 1728 square inches, placing it among the largest in its size category. 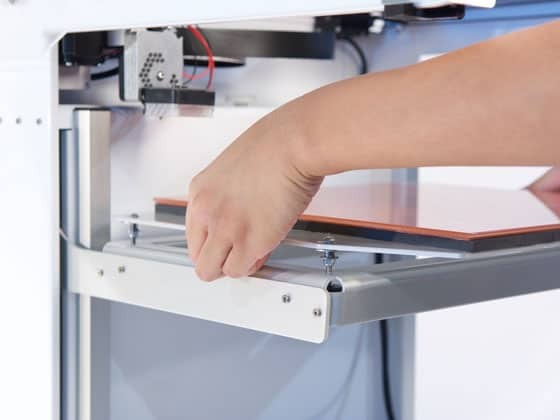 The heated bed itself is made of borosilicate glass and can reach temperatures up to 120 degrees Celsius in under 4 minutes while being readily removable and fitted with a BuildTak FlexPlate for added adhesion. 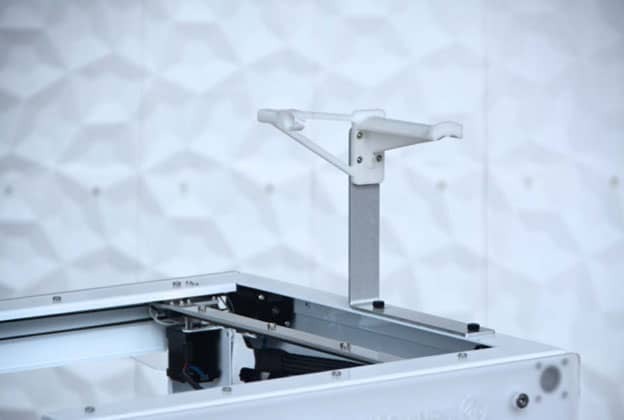 Type A Machines is aiming for improved stability and consistency in printing results with this significant upgrade – they claim the manufacturing tolerances for the glass are less than a micron, which means one seriously flat surface. The Series 1 sports a proprietary all-aluminum G2 extruder design at odds with the typical extruder configuration. It ostensibly reduces filament clogging and oozing problems by channeling filament through a single contained melt path. This upgrade also signifies a longer life span for the extruder and hassle-free cleaning alongside more refined control of the printing process and temperatures up to 300 degrees Celsius. The design means parts like the hot end and nozzle are also modular given how simple they are to remove, clean, and even replace. A set of LEDs are also fitted to the print head to aid diagnostics. With a nozzle diameter of 0.4 mm, the extruder can lay down resolutions between 50 and 300 microns for consistent results with the ability to go from 25 to 600 microns under the right circumstances. XY accuracy comes in at 6.57 microns, while Z-axis accuracy sits close at 6.25 microns. Overall print accuracy tallies in at around 100 microns. The Series 1 is compatible with multiple types of PLA, PET, Nylon, ABS, flexible, carbon-based and TPD (NinjaFlex for example) materials. 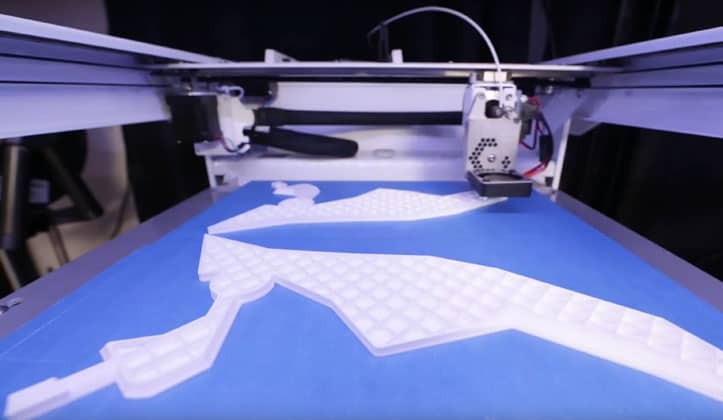 There’s no beating around the bush; the Series A is a versatile printer. 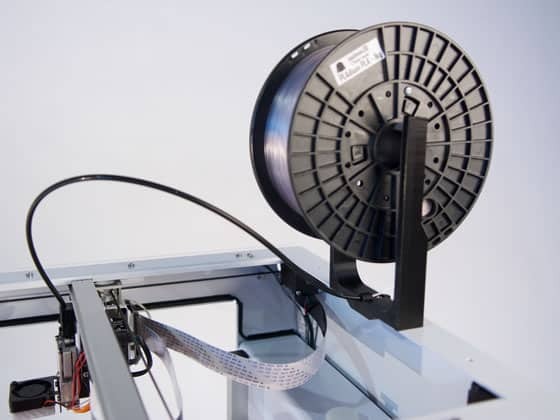 The filament system is also open to third-party spools/cartridges in standard 1.75 mm diameter. Depending on the Series 1 or Pro model, the printer comes with Wi-Fi, Ethernet, and USB-to-PC connectivity for across the board tethered and untethered access. Although the Series 1 has no onboard display, it does have a one-touch on/off button on the front panel. 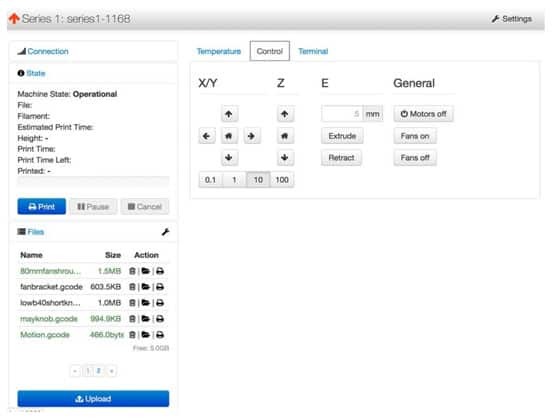 As for software, the Type A Machines Series 1 uses a version of the Cura slicer configured specifically for Type A Machines printers that can read STL, OBJ, and AMF files with compatibility for Windows, Mac, and Ubuntu OS, alongside an onboard custom browser-based Series 1 Interface based on Octoprint that reads GCO and Gcode files. Additional features include a 1.3 megapixel onboard HD camera for the Pro model that can capture real-time video, produce still images, and time-lapse recordings. 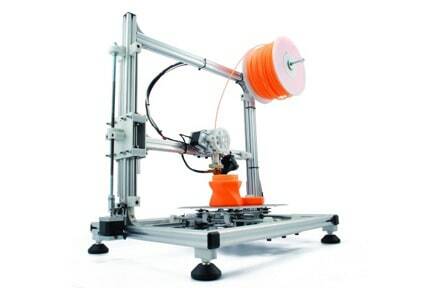 Alongside the Series 1 printer, the package includes an accessory box (power cable, ethernet cable, palette knife, glue stick, antenna, ceramic screwdriver, wrench kit, 20ft PLA filament sample, business card for leveling), a hardware bag (spool holder kit, panel standoffs, and Allen keys), build platform, and side panels. Installation is reasonably straightforward and involves installing the various acrylic side panels with bolts and spacers. Interestingly, these don’t just serve a cosmetic purpose but help with ventilation and stability during the printing process. Next, the spool holder sits on an L bracket secured by bolts and the build plate is seated on standoffs and locked into place. Pressing down on the extruder lever then feeding the filament into the exposed hole is easy enough, and we didn’t encounter any snapping or bristling issues. Calibration is a doddle thanks to a nifty Z height adjustment knob that does all the hard work for you. Of course, you’ll need to ensure the distance between the print head nozzle and the platform is just right yourself, but the knob helps greatly. Across the board, the quality of the prints was always there regardless of the type of material including flexible filaments. We did encounter a few issues with the test print with the first layer crushed into the build plate, but a quick recalibration sorted this out immediately. From here and across a dozen various tests, the Series A didn’t fail us once. From a visual point of view, the Series 1 is such a smooth workhorse from the almost choreographed movements of the extruder to the near-silent operational levels. Not once were we bothered by noise levels or janky jitters. Type A Machines sadly shut its doors in early 2018, handing over support duties to Solid State Printers, which services the Series 1/Series 1 Pro alongside selling replacement parts and the like. As such, no customer support team exists to offer troubleshooting guidance or advice. 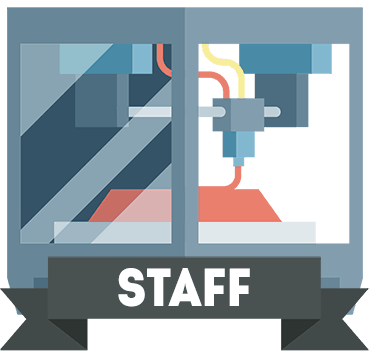 Users are therefore very much on their own or must lean on 3D printing communities scattered across the internet. Point of sale warranties may offer refund clauses, but chances of actually picking up a Series 1 are pretty slim, to begin with, given the quality of the device and the numerous awards it garnered before Type A Machines shut down. 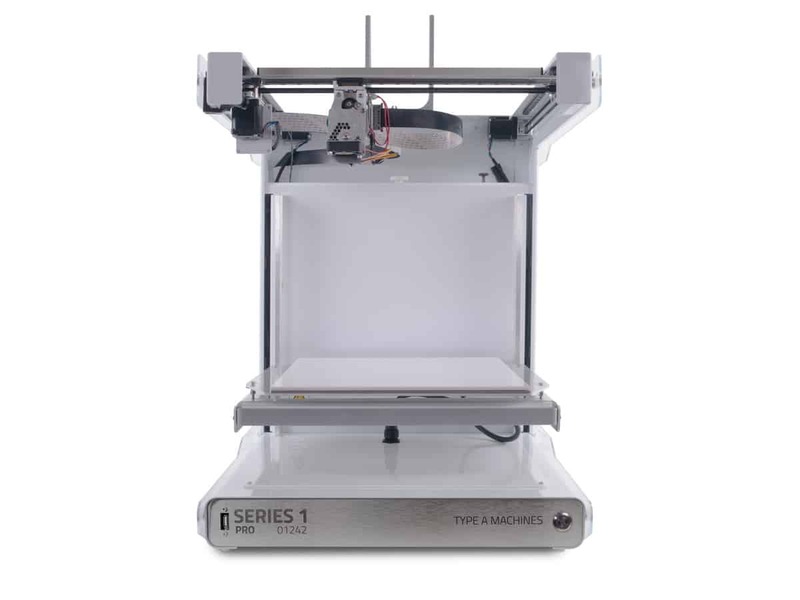 Beyond being one of the most stylish mid form factor prosumer printers out there, the Type A Machines Series 1 is nothing short of an excellent and smart investment, if you can get your hands on one. The design, build, and quality of the parts work in unison to produce outstanding prints while equally allowing room for modular upgrades and improvements that make the Series 1 somewhat future proof. 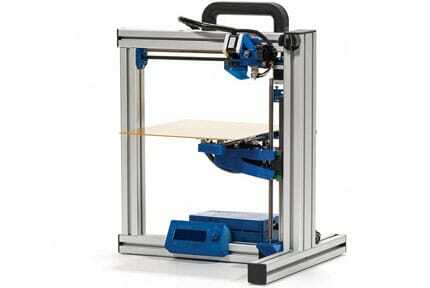 A versatile 3D printer that oozes style and systematically produces quality prints. The ease of use and pleasant user experience make it ideal for first-time buyers and versed makers alike.